I enjoy volunteering- not always because it helps people but because it makes me look like I have my life put together. However, volunteering today had an alternate ending that drowned out my desire to look good, thankfully. Today I volunteered at a woman’s fly casting class through the Women’s Fly Fishing club in Boise. The instructor and I walked around for 4 hours- talking to people, teaching them and helping break old fly casting habits. When each group would walk towards the pile of rods leaned against the table, they would see me and probably think I was a professional fly caster, flown out from a different state on a privately chartered jet to assist them today. Not because I looked amazing or anything, I just know from personal experience that when you are doing something new, everyone around you seems like a professional. I was enjoying being labeled a ‘fly caster’ versus the normal redundant role of stay at home mom or house cleaner/chef/magician. 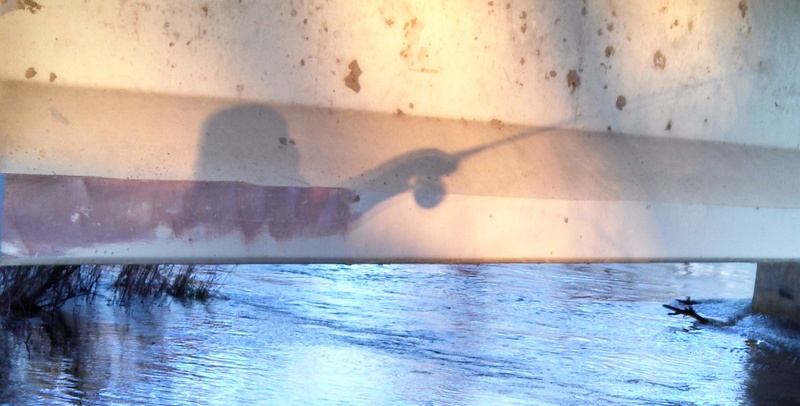 In the beginning of the day, I was not about to give up my true identity without a good reason to (truth: I volunteered for the position versus being the ‘chosen one’ to assist in fly casting today shhh). And I said, “Yes, I am”. No I didn’t. I couldn’t lie, but I wanted to- I wanted to be the pro fly woman there who is well established in the fly fishing world and held some record for awesomeness. I went to help a woman who appeared frustrated. She was standing in the middle of the group with her fly rod in hand, staring out at the road versus working on her form. She started to cast when she saw me. “How is it going over here”, I asked, even though I already knew the answer. “I’m horrible. I just got my line stuck in the tree. My husband thought this class would help me because he is not patient with me. I desperately want to be out there fishing instead of reading a book on the sideline- I don’t want to live life on the side line”, she said. I looked around to see if the main instructor was anywhere close to go ahead and ‘take this one’, but I realized it was all on me; I had to come up with the perfect words, instructions and encouragement for this brave woman. I rehearsed what the professional might say, since I was trying to emulate one, but then my psychology mind kicked in and I swung from the hip. “We are going to get this down today so you can practice at home- so stop saying negative things to yourself. Your comment of ‘desperately wanting’ is very encouraging because that means you will not give up on yourself. Let’s do this”. I watched her cast a few times and carefully provided criticism or ideas for her to work on her form. “You are doing great. I like how you are keeping your wrist tight. Now let’s try to keep your arm closer to your body while also keeping your wrist tight”. She was constantly looking at me for approval and validation- I handed it out like free cupcakes because I was thoroughly impressed with this woman and her grit to keep working hard. She was out there trying to learn a new skill, no matter how intimidating it was or how horrible her cast was when she started. She started to cry. As ‘not a professional’, I get why she was crying. Some people shrug it off like “women are so emotional”, but that is not the ‘why’- she was proud of herself. She was battling giving up and allowing the negative self-talk, something she may have heard from her husband or somewhere in her life of “you will never get it” or “you will never add up”, and she overcame those thoughts. Overcoming a battle like this is worth tearing up for. We chatted about this briefly and high-fived. After my time with this woman, I looked forward to each new group to come to our class; not because I wanted to be able to to strut my stuff as the professional, but because I was enthralled with their stories, perspectives and the challenges they were there to overcome. Half of the women there were on their own, without anyone else in their life to teach them how to fly fish or nudge them towards it; they just want to learn for themselves. How tough are they? Tougher than most I will say. The passion in these women I worked with put me in my place because instead of wanting to be a ‘professional’ I wanted to be them- I wanted to risk looking foolish in order to learn a new skill or taking those things in my life that I often feel like giving up on and pushing forward, like they did today. They were all eager to learn as they appreciated feedback and then worked hard to correct their mistakes. One by one their casts went from choppy lines flailing in the air to smooth jet streams rolling back and forth. Their excitement reminded me of the reason I love fly fishing so much- once you learn the graceful movements of a fly cast, you desperately want to improve in all areas of fly fishing….it gives you something to feel good about and work towards. It was lovely to see these women taking this step towards a possible future in something that helps me find balance in my own life. So often women that go through raising kids, or battle through a difficult marriage, or suffer the loss a loved one, end up on the other side of those difficult things- wondering who they are or what they are even capable of. Many shy away from doing what is on their hearts to do- go back to college, move to an orphanage, re-learn the violin, take writing classes, or become a karate instructor because they think it is too late for them to learn or they don’t want to look silly. Being able to watch a woman who has never even see a fly rod in person, pick it up, learn about it and then succeed at the basic fundamentals of casting within an hour and then finish with a smile of accomplishment, is a perfect example of how some things in life are worth looking silly for! Some things in life are worth persevering for. I don’t want to sit on the sideline when I know that I could be playing in the game if I don’t give up on myself! After the class, I visited more with the ladies and got a few numbers of the ones that want to fish with me sometime. They were weird about fish, like me. I said my good byes and took off to check out the Boise River flow before I headed home. The parking lot was full at my normal fishing spot so I had to park quite a ways from the river and walk. It ended up playing out with me, in my full waders, fly rod and fly bag, traipsing through family BBQ’s, a volleyball tournament, and a couple of teenagers making out on a blanket. As I wove my way through the high volume of bike traffic on the green belt path way, I tried to keep my eyes focused on the river so that I didn’t care too much what those around me were thinking. Yes, people turned their heads. Yes, they looked around to see if I was by myself- where is that lady’s boyfriend/husband, is he coming behind her? Does she know how silly she looks? I thought about my ladies today and decided that some time on the river was worth looking extremely awkward and out of place. I smiled, sort of enjoying being the confusing spectacle that my audience was trying to figure out. I climbed through the trees and waded through a muddy side stream. There were a few guys spin fishing across the river and people walking on the path above me. I realized that I have moved pass the self-conscious stage of worrying about others watching me because I didn’t even think twice about trying to find a place out of the lime light. I tied on my nymphs and casted in the afternoon sun. I don’t need to be a professional to enjoy life and I don’t need to wait for the perfect set of circumstances to take risks in life. I just need to keep moving forward and make sure I am not living life on the sidelines! Cheers to women that inspire me and to those that take life by the horns, regardless of what others think of them or tell them they cannot do! Float Tube Selfies- Oh Carp! You many be a “non-professional” fly caster but you’re a pro when it comes to people. Thanks for writing this inspiring story! Thank you so much! I love fly fishing and people- Its neat when the two worlds collide. 🙂 Thanks for reading my story!